Namdaemun Market, the largest traditional market in Korea, is a well-known and popular tourist spot. Namdaemun is the nation's wholesale centre and one can practically find anything here. However for clothes, I still think that for clothes, Dongdaemun is a better bet. I've always thought that Dongdaemun is a night market, and Namdaemun is a day market. True in it's Facts, but not exactly accurate, depending how you define day and night. Dongdaemun wholesalers start business at night, from 8pm and ends the day at 5am. Some wholesalers double up as retailers would stretch their business up to 5pm. Namdaemun, on the contrary, starts business as early as 5am in the morning. According to some websites, business starts as early as 11pm the night and last through the day. Well, for a typical tourist that is not into wholesaling, we'll look at the retailers business hours. For most tourists like myself. Namdaemun would be a more interesting place in the day. Namdaemun, would be a place to go for foodstuff, and Dongdaemun, at night, or even past midnight, to shop for clothes. Namdaemun is filled with busy street stalls. You find street stalls lined in alleys. A place I recommend for getting local foodstuff, kitchenware and household items. Look at how many different kinds of seaweed you can choose from. Definitely spoilt for choice. Some shops have samples though but you'll be obligated to buy if you do try the samples. 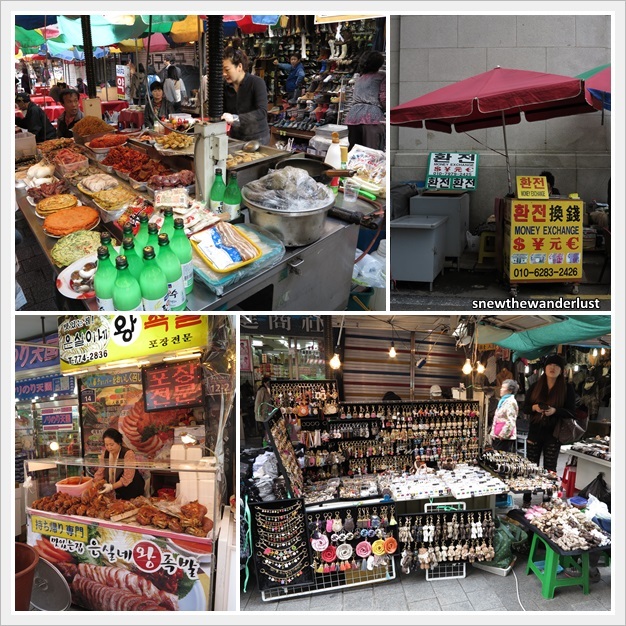 My most memorable part of Namdaemun is the food alleys or the food streets. Some of the "cooked" food stalls, similar to our Singapore "Economical Mixed Vegetables Rice". The stalls have makeshift tables and chairs. It's amazing to find it in a developed country like Korea, but such street-food stalls are becoming an extinct species in Singapore. 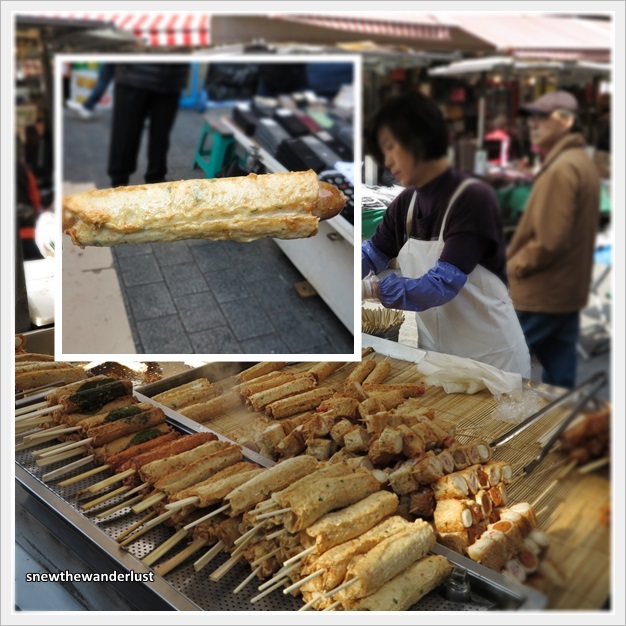 You can find a number of stalls that sell this fried fish-cake stuff with sausage. They make the batter there and fry it on the spot. Looks really yummy, but truly unhealthy. We choose a stall that is pretty popular. Well, Papa Snew is a bit concern of the re-used oil, so we do try to find one which the oil that doesn't look too over-used, judging by the colour of the oil. Another popular stall that has long queue is this Hotteok (or Hoddeok). 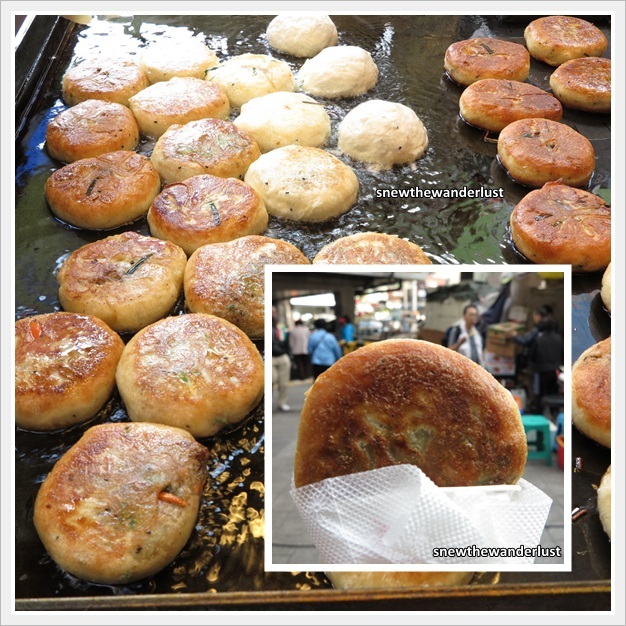 This comes in a variety of filled Korean pancake and is a popular street food in Korea. There's a variety of sweet or savoury filling to choose from. I tried the one with vegetables, which is stuff with veggies such as chives, carrots and Korean vermicelli (our chinese "Tang Hoon"). It was so interesting that I have to try one of it despite the long queue. Papa Snew is not into Chives, so he choose the sweet one with red-bean filling. It was yummy as well. There's much more of stalls than this. However, this being towards the last day of my trip, my human battery is running low and my legs are beyond me. Walking is a lot in Korea. Do be prepare to do tons of walking if you are exploring these places on your own. Look at the makeshift money changer in the top right hand picture below. I heard that the rates here is not bad, though I didn't ask.